The Windows Phone 8X by HTC has been unveiled as the signature device for the Windows Phone 8 platform. Announced during a special press conference in New York, the flagship HTC 8X will head up the Taiwanese firm's new range of Windows Phone 8 handsets. We've seen various details on the 8X leak over the past couple of months, under the moniker HTC Accord, and we can now confirm it will pack a 4.3-inch, 720p HD Super LCD 2 display, 1.5GHz dual-core processor, 1GB of RAM, 16GB of internal storage and of course Windows Phone 8, putting it inline with the Nokia Lumia 820. While manufacturers can do little in terms of tweaking the Windows Phone 8 platform, with Microsoft denying the level of customisation you find on Android, HTC has looked at other ways of adding value to the Windows Phone 8X. Two main features are sound and camera. First up, HTC has stuck a couple of amplifiers in the 8X, one on the 3.5mm jack and the other on the internal speaker, delivering louder, but not distorted, tunes – which is further enhanced by Dr Dre's Beats Audio Technology. Secondly HTC has added some wizardry to the camera, boosting the 8MP rear snapper with a backside-illuminated (BSI) sensor for improved low-light performance, along with an f/2.0 aperture, 28mm lens and a dedicated imaging chip - allowing users to take some great photos, plus there's a single LED flash on the back and it can capture 1080p, full HD video too. If all that wasn't enough the HTC Windows Phone 8X also packs a 2.1MP front camera, NFC, Wi-Fi, Bluetooth, A-GPS, DLNA and FM radio into a 10.2mm all-in-one chassis which comes in four different colours; California Blue, Graphite Black, Limelight Yellow and Flame Red (US only for now). TechRadar has already spent some time admiring the new handset, although it wasn't running the complete Windows Phone 8 platform, so make sure you check out our hands on: HTC Windows Phone 8X review. 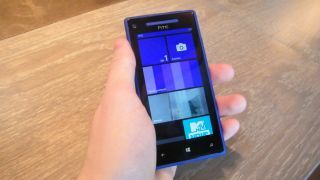 The HTC Windows Phone 8X release date and price are still unconfirmed, but the handset is expected to hit stores in early November.